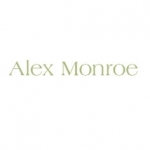 Alex Monroe jewellery is synonymous with a very British sense of style. It is feminine, delicate and quirky, but above all consistently wearable. Now a much loved brand world-wide, each and every piece is individually designed and handmade in England by Alex and his team of expert jewellers. Inspired by nature and nostalgia, every piece has a tale to tell…and the story continues with you.